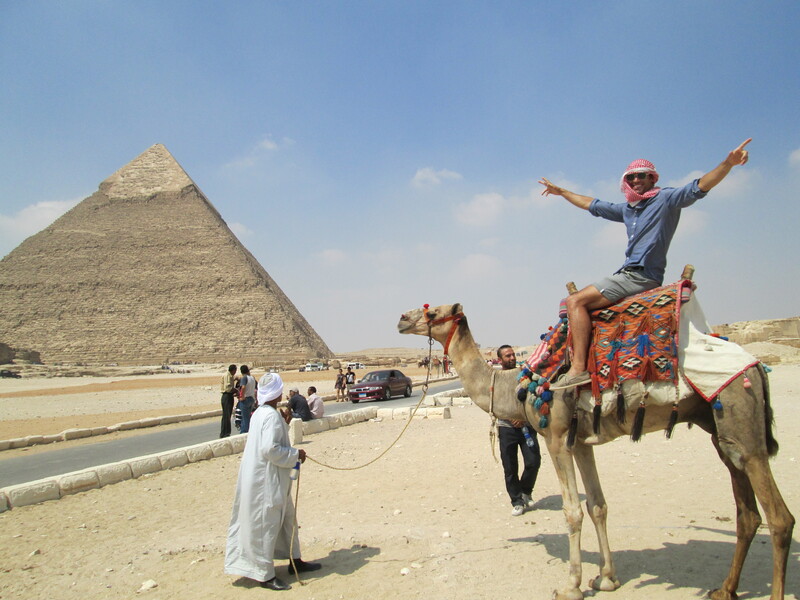 I was in Cairo… and pretty much the one thing you actually must do in Cairo is see the pyramids… and, luckily enough for me, my new friend Hossan had offered to take me (to which , of course, I said yes). He was an antiques dealer, and did most of his work in the afternoons and evenings (a general trend in Cairo), so he was free to do whatever most mornings (timely for me, given that Egypt is basically one giant desert, so it’s much cooler in the mornings than the afternoon). So one morning, Hossan picked me up in his car outside my hotel and we were off. The pyramids are in Giza (i.e. the famous ones you all see pictures of), and are about 25-30 kilometers from where I was staying in downtown Cairo (fun fact for all the geography nerds out there… Giza is simply the city on the other side of the Nile from Cairo… like Boston and Cambridge). The drive itself was interesting simply for the fact that I got to watch Cairo traffic in action… no real lane divisions (even on the freeway), constant honking, constant movement… keeps any driver on there toes, that’s for sure. As we drove south, you can, at times, see the pyramids sticking out over the horizon (above the buildings). Upon arrival, we did the the general Egyptian shuffle… having to talk to several people about which lines both of us had to stand in (there are different lines, and prices, for foreigners and Egyptians), having to bribe the correct person to park inside the gates, and then getting (not paying, you do that when you get back) another person to watch the car while we were gone… unfortunately, standard issue stuff here. Then we’re in… ahhh, the beautiful wonders of history… but, without missing a beat, the hustling really starts. There was a constant chorus of folks offering to be your guide, a camel ride, souvenirs, or, my favorite, to take your picture (after which they would demand money before handing back your camera… luckily, I knew about this one before I got there)… another good line from a purported guide was, “you know you’re not allowed to walk around without a guide,” which is, of course, completely false. Even being with an Egyptian didn’t seem to matter… the hustling was constant, but you did get used to it. 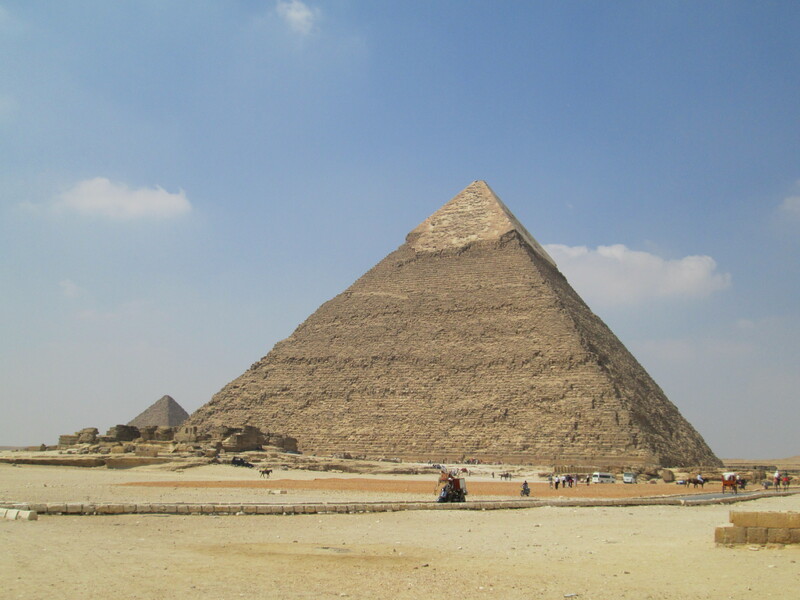 Hossan and I walked around for about an hour… enough time to walk around the three major pyramids and the sphinx. 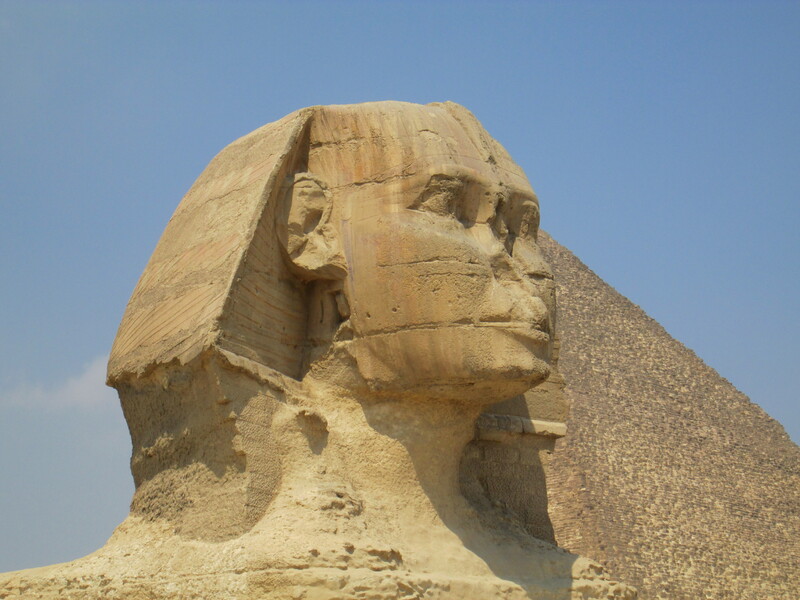 The pyramids and the sphinx are very impressive in person… it’s just a shame they’re in Egypt, as the touts really do take away from the experience. Some interesting notes, the edges of Giza (i.e. the buildings and neighborhoods) pretty much run right up to the base of the heights that the pyramids are located on… so two sides of the pyramid complex is surrounded by city while the other two appear to be desert (I say appear because there’s no telling what’s behind the small sand hills in the distance). And yes, the rumors are true, there is a combination Pizza Hut/KFC located right next to the sphinx, luckily it’s outside/behind the walls enclosing the area so you can’t see it from the sphinx. I found it very interesting that they’re weren’t many foreigners there at all… there were lots of tourists, but most of them appeared to be Egyptian (by their style of dress). I did bite on getting my picture taken on a camel… and, yes, they do smell as bad as you think they do. Nothing says last remaining wonder of the ancient world like a laser light show right… makes me wonder if “Rock You Like a Hurricane” made the cut in the accompanying synchronized musical score. 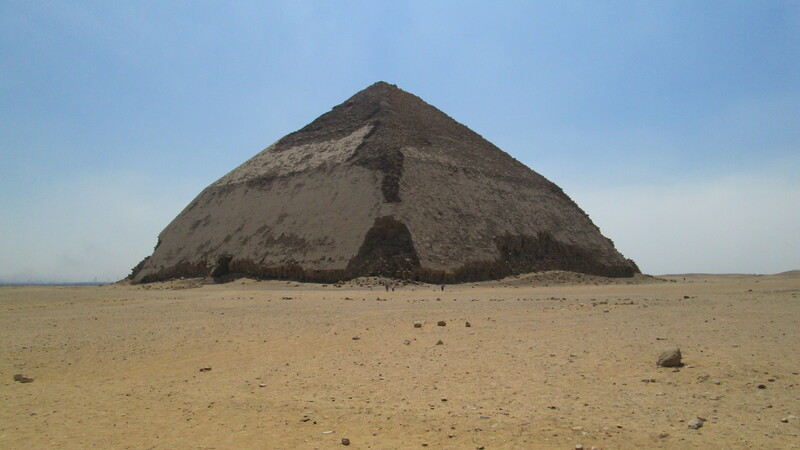 Perhaps a little known fact, but there are other pyramids in/around Cairo besides the pyramids at Giza. Even better still, they are far less popular (because they’re located a decent ways outside the city), so there’s chance to have a pyramid or two all to yourself if you go. I hired a driver, through my hotel, to take me out to see them one mornings. There’s two sites, one at Dahshur (containing the bent pyramid and the red pyramid), which is about 40 kilometers outside of Cairo, and one at Saqqara (containing the step pyramid, the first one built by the Egyptians, and a lot of other funerary monuments), which is about 30 kilometers outside of Cairo. Not too much to report for the trip… I hit Dahshur first, where I went inside the Red pyramid (claustrophobes need not apply… the entrance shaft is maybe three or four feet high and probably 100 meters long… and the air inside the interior rooms reeks of ammonia). The nice thing about the Dahshur pyramids is that they’re as you might imagine the pyramids to be location-wise… seemingly plopped down right in the middle of the desert. Saqqara was next, lots to see there (although nothing as impressive scale-wise as the other pyramid sites) because Saqqara was the original royal burial ground for the ancient Egyptians (as it’s located across the Nile from what used to be Memphis, one of the various capital cities of ancient Egypt… although now there’s nothing there but date palms). Things to note… you can see both the pyramids at Giza and Dahshur from Saqqara, there’s a decent museum (with air conditioning, focuses mainly on the guy who’s spent the last 50 years excavating the site as well as Imhotep, the architect of the first pyramid), a couple of the tombs have intact friezes on the walls and you can go inside a small pyramid (in which I nearly got smacked in the face by a bat in the narrow tunnel on the way down). 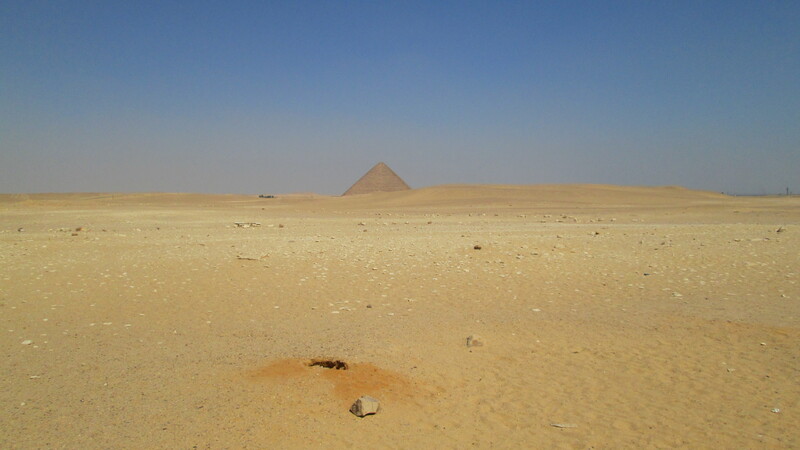 The best part of the trip out to Dahshur and Saqqara was that there was very few other tourists, and consequently, very few touts (although there were some of course… this is Egypt after all). So there we are… I saw the pyramids. The red pyramid in the distance. 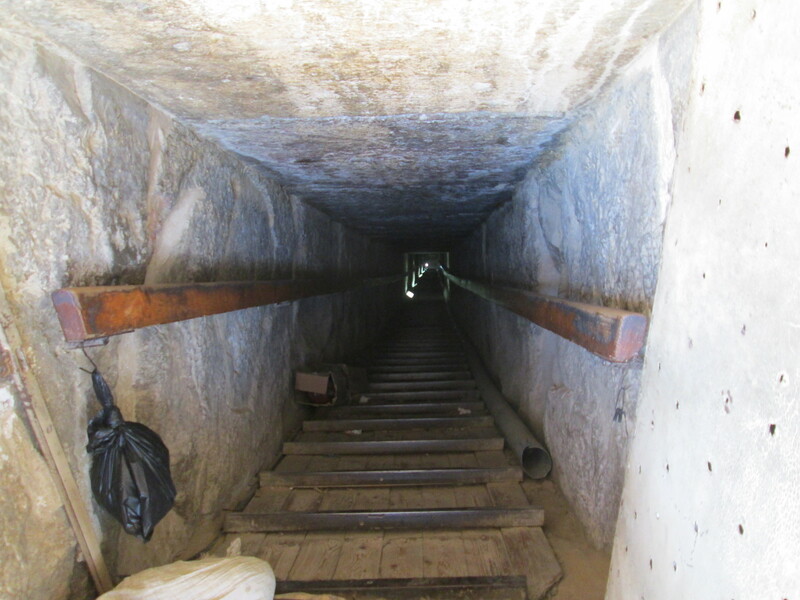 The entrance shaft into the red pyramid. 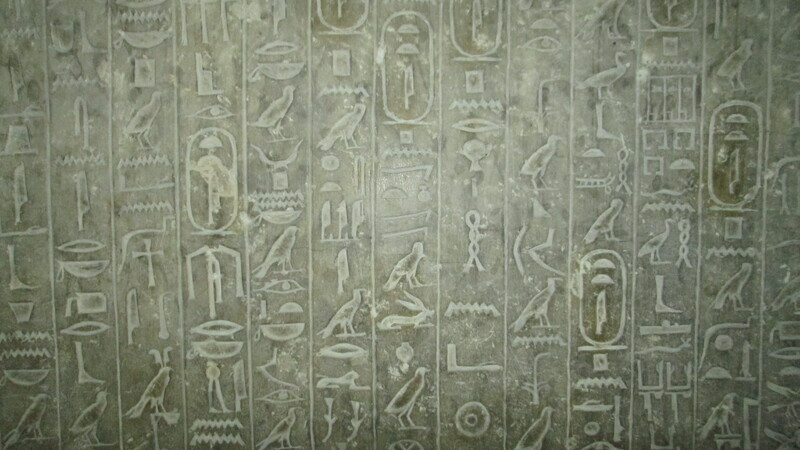 Hieroglyphs on a tomb wall inside one of the pyramids at Saqqara. 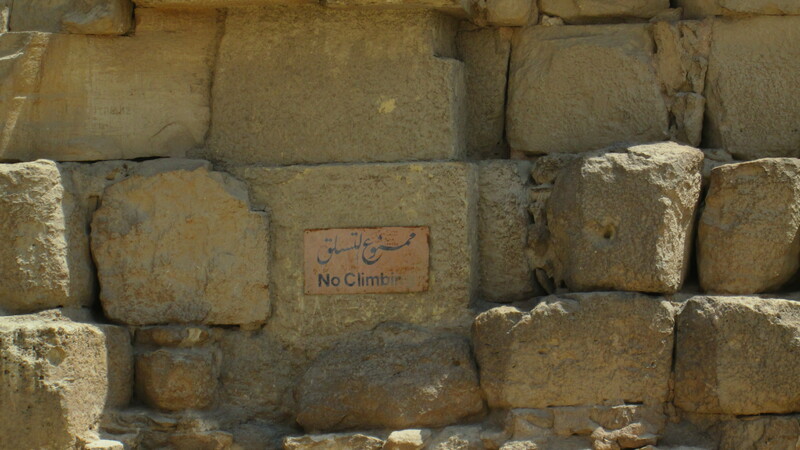 This entry was posted in Egypt by Richard. Bookmark the permalink. Q: What did the Egyptian guy say to the Egyptian girl? A: Come with me behind the pyramid, and I’ll make you a mummy. Upon awakening in the land of the dead, the mummified body of King Tut stretched forth his dessicated limbs and rose. 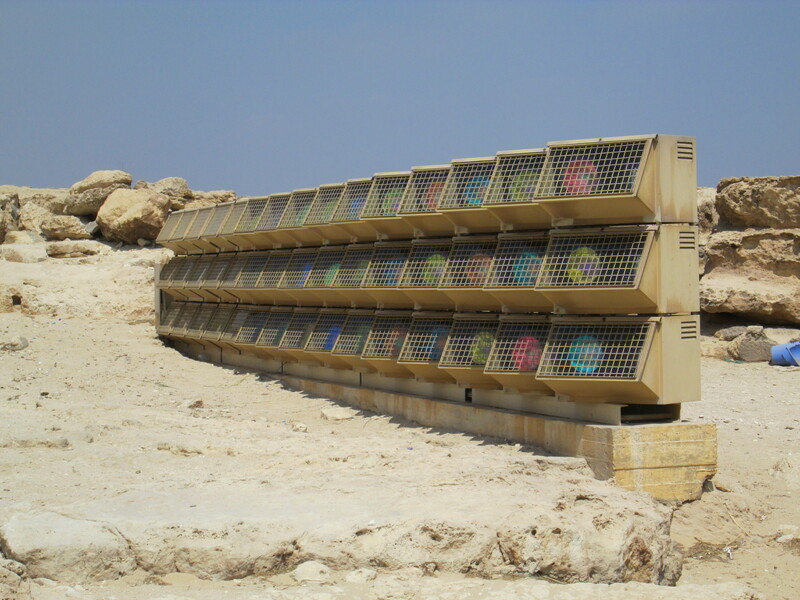 He opened his eyes and beheld his faithful servant Sem, already awake and prostrate on the cold stone, patiently awaiting the Pharaoh’s least request.